Contemporary design meets island-living with this cocktail table. 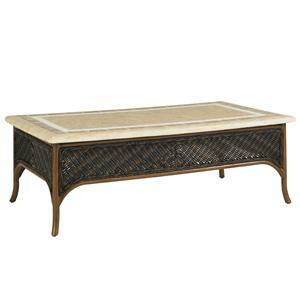 Bring the relaxing nature of a living room to the beauty of the outdoors with this rectangular cocktail table.The weatherstone top is finished by hand, with artisans recreating the natural character of crushed bamboo in a sundrenched sienna finish. 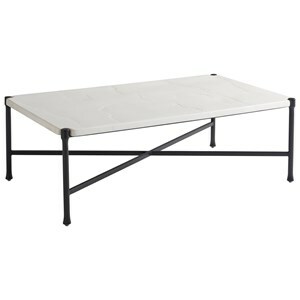 The darker finish on the aluminum frame exhibits a contemporary balance of textures and color while providing stability and durability appropriate for the outdoors. 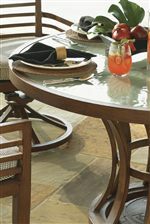 The Ocean Club Pacifica Weatherstone Rectangular Cocktail Table by Tommy Bahama Outdoor Living at Baer's Furniture in the Ft. Lauderdale, Ft. Myers, Orlando, Naples, Miami, Florida area. Product availability may vary. Contact us for the most current availability on this product. 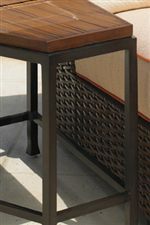 Finish Description The Ocean Club Pacifica collection features a sun-drenched Sienna finish.Finishes of Tommy Bahama Outdoor Living products are specially formulated, with custom base coats and painstaking handwork, to achieve a look unique in the industry. Ultra-durable polyester resin powder-coated finishes are baked on aluminum frames, ensuring that they are colorfast and highly resistant to damaging UR Rays. Finishes are also corrosion and scratch resistant. Techniques like dry brushing, padding, burnishing are used to add to the design and style of the collection. 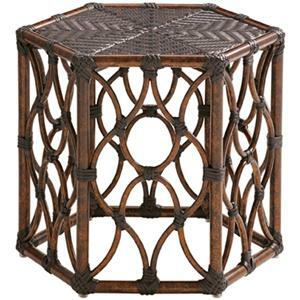 Construction Sturdy metal frame with woven rattan look. Drawing inspiration from exotic islands of the South Pacific, Ocean Club Pacific features a captivating fusion of east-meets-west styling. With soft contemporary lines and striking architectural elements, the collection beautifully combines island living with contemporary design. 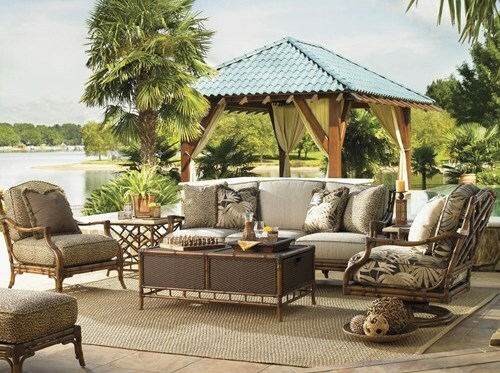 The lifestyles blend seamlessly in designing your custom outdoor living area. 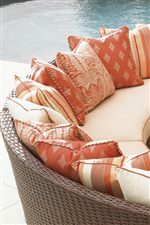 Ocean Club Pacifica features a striking horizontal design motif and the natural look of woven rattan. 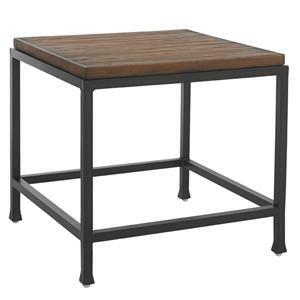 Weatherstone table tops provide the look of bamboo, providing exceptional durability, UW resistance, stain resistance and protection with a polyurethane sealant significantly reducing the need for cleaning and maintenance. Also adding to the island nature of the collection is the use of etched glass on select table tops which simply mimic soft waves of the sea with its texture and design. 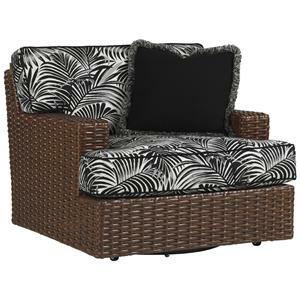 The collection includes both linear and curved sectionals for the conversational seating style of your choosing. We invite you to create a soulful retreat that slows your pace and captures the essence of refined island living. 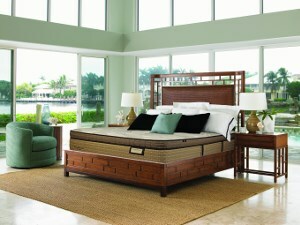 Ocean Club Pacifica embodies the soft contemporary side of Tommy Bahama, with inspired designs and effortless style. 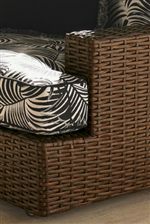 The Ocean Club Pacifica collection is a great option if you are looking for Contemporary Tropical Outdoor Furniture in the Ft. Lauderdale, Ft. Myers, Orlando, Naples, Miami, Florida area. 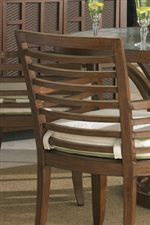 Browse other items in the Ocean Club Pacifica collection from Baer's Furniture in the Ft. Lauderdale, Ft. Myers, Orlando, Naples, Miami, Florida area.